About 100 residents of East Vancouver's Strathcona nieghbourhood staged a protest this morning to draw attention to their demands that the city reduce traffic along the Prior Street feeder route for the Georgia Viaduct. Residents of East Vancouver's Strathcona neighbourhood are demanding that the city reduce traffic along the Prior Street feeder route for the Georgia Viaduct. About 100 residents turned out to protest on Friday morning, saying they are concerned the city's plans to tear down the 40-year-old viaduct that links the downtown core with East Vancouver will make busy traffic even worse. 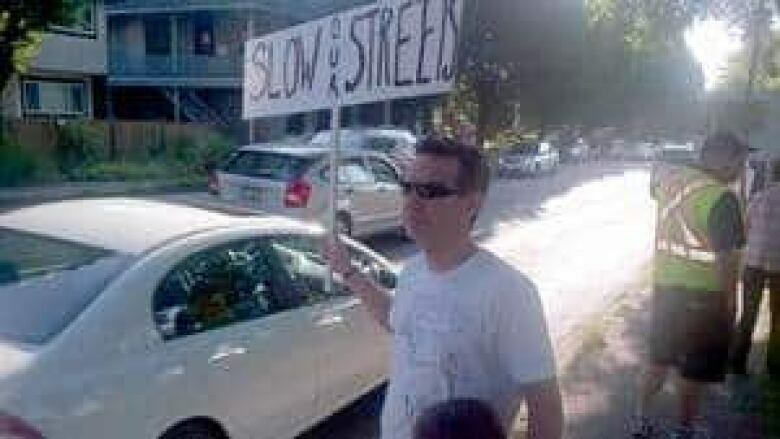 Now they want the city to institute some traffic calming measures or direct vehicles away from their neighbourhood. Protester Ian Christy used the walk signals at a pedestrian controlled intersection on Friday morning to slow down traffic along the busy four-lane thoroughfare. "By doing this we're basically, hopefully, making motorists conscious that, really, exceeding the speed limit here is as bad as exceeding next to a school," said Christy. Resident John Hawkes says the residents' concerns are liveability, not property values. "We're not house flippers. We're families and we're worried about safety." While Hawkes admits he bought his house when the viaducts were already a major thoroughfare, he says traffic has become much worse. "As trucks go by, the house will shake," said Hawkes. The viaduct was built in the early 1970's as the first part of a freeway planned for East Vancouver. But plans for the freeway were eventually scrapped because of community opposition. The city is now currently considering options to tear down the viaduct.